Find a vehicle that best suits you. Great service. Very comfortable waiting area. Also a good restaurant to make the wait a bit easier! Awesome dealership! Second vehicle purchased here! Friendly people who can work with our situation (any situation), which keeps us coming back! Bought NEW Rubicon last August and these guys have serviced it ever since. Have put over 150K miles since, and am really pleased with them. Facility is above reproach! But, that’s the ONLY Fernelius that I was treated above and beyond. 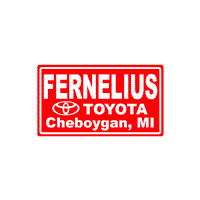 Fernelius Toyota invites drivers and car buyers in Northern Michigan including Gaylord, Alpena, and Traverse City, Michigan to shop and explore our website and full-service Toyota dealership in Cheboygan, MI for all of their automotive needs. Since 2004, our family owned and operated dealership has been serving drivers as a dedicated Toyota dealership. When you walk into the Fernelius Toyota showroom, you become a member of our family — and that includes family pricing and family care! Drivers from throughout Northern Michigan, Northeast Michigan and the Upper Peninsula turn to us for new Toyota vehicles at family prices, so become a member of our family today! Shop our website, contact our team at (888) 337-6354 or visit us in Cheboygan at your convenience. Turn to Fernelius Toyota for an extensive selection of new Toyota cars, SUVs and pickup trucks for sale in Northern Michigan. Explore our inventory online or on-site in Cheboygan, where you can find that new Toyota RAV4 or Tacoma that suits your adventurous side. Every new Toyota and used car for sale here is competitively-priced, thanks to the family pricing you will experience as a member of the Fernelius Toyota family!